What do I say about the Volkswagen Tiguan? Well let me relate it to this - It was a thumb rule in school that whenever my mother came to receive both mine and my sister's results, she spent most of her time in my class. My sister's academic credentials or class behaviour was never a problem and hence mom happily pranced into her class and got out within 30 seconds. In my class, however, she spent a good hour, trying to convince the teacher that my behaviour in class would improve. My luck ran out a couple of weeks later, when my science teacher decided to throw me out of class for shouting out loud in class. I spent the next two weeks outside class, but the third week I was allowed in, when she discovered that I had excelled in my practical examinations, which basically proved a point. I was let into class and no further questions were asked. Similar is the fate of the Volkswagen Tiguan. It was never there, when it was supposed to be and only when the demand in the Indian market grew, did Volkswagen decide to bring the SUV to India. The Tiguan is in fact part of a larger plan for India and I'll tell you more about it, but the fact remains that an SUV, which sold 2.8 million units worldwide, since 2007, found no place in the Indian car market till 2016. Yes, the previous generation was not all that flamboyant looking and even if VW had brought it to India, it would have had to stand up against the likes of the Chevrolet Captiva, Ford Endeavour and the best-selling Toyota Fortuner. A chat with the folks at Volkswagen reveals that the car was to be brought to India, but then it was decided to stick to the hatchback and sedan segment, where success was imminent. 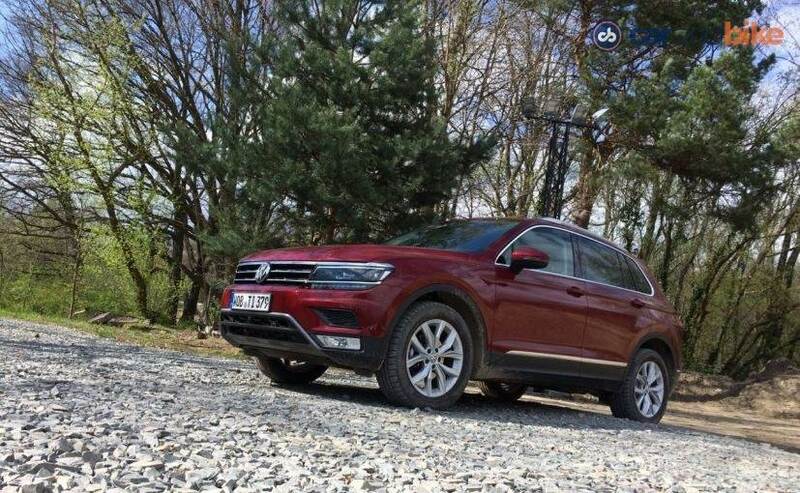 But now, with the rise in the sales of SUVs, in India, Volkswagen has woken up to the reality and has already announced its intention to introduce the new generation of the Tiguan, in India. 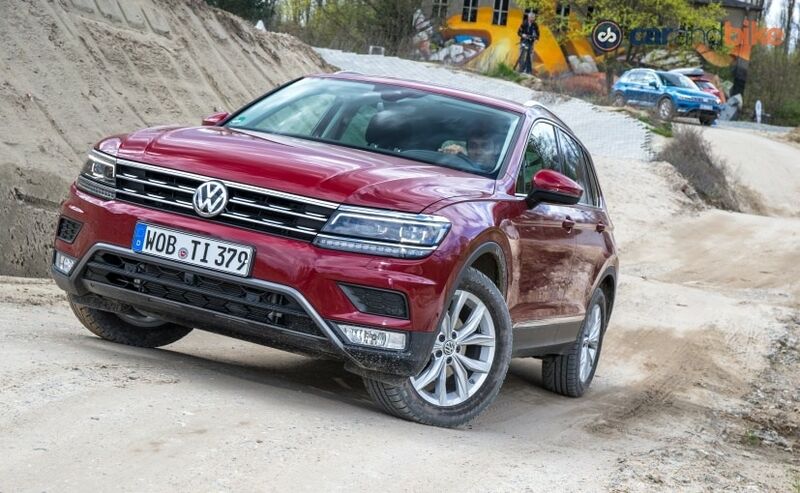 The popularity of the SUV is such that even when it was announced that a new car would be underway, this year, VW managed to sell 240,000 of the old-gen models, last year. The new Volkswagen Tiguan is significantly different and it all starts with the look of the car. 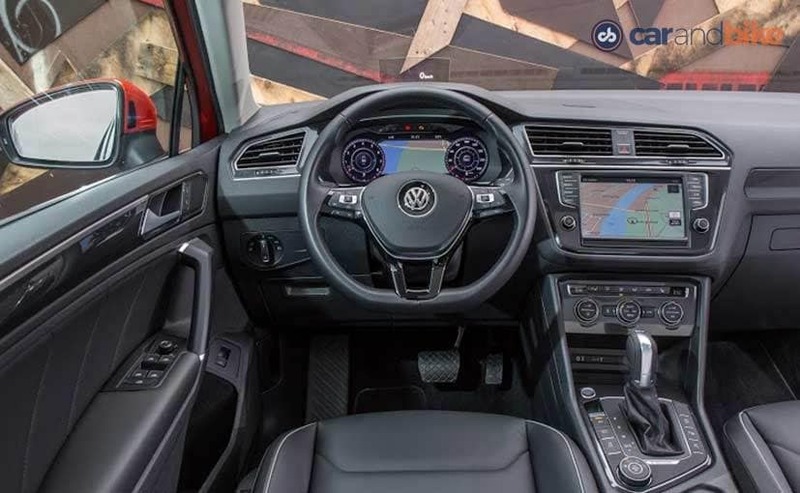 While it may look like the Tiguan borrows much of its look from the Passat or the Golf including the platform its built on, the Tiguan is the first SUV to be built on the MQB platform and yes we've seen a whole bunch of products come to India, based on this platform. Cars like the Skoda Octavia and the Superb are based on the MQB and are already on sale in India, but the Tiguan is a whole new ball game. The second generation of the car will be coming to India and it will be available sometime later this year or early next year; and that is because the priorities are the Ameo, Passat GTE and the Polo GTi. 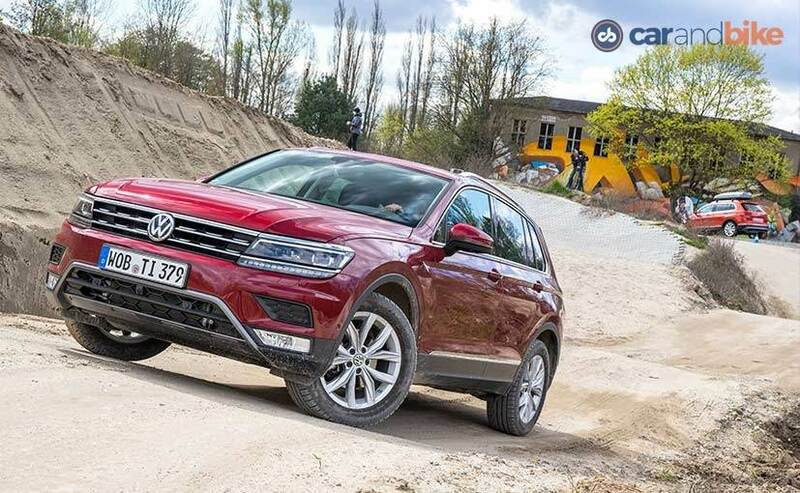 Sold in 170 countries the new-gen Tiguan will spawn an entire family of SUVs and the folks at Volkswagen say that, in the next two years, it will ensure that there is an SUV that will cover different segments and we'll see this change both in Europe and India. 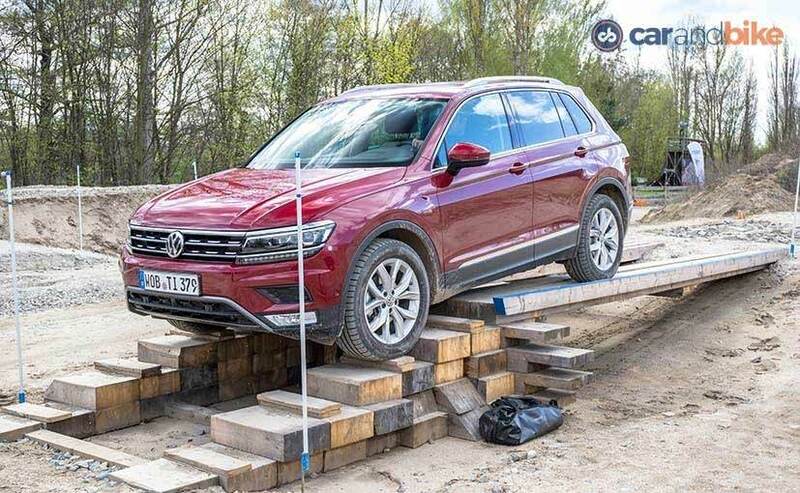 For the time being though, we will have to content with the Tiguan coming into our market and the company is extremely excited to see how well it does. 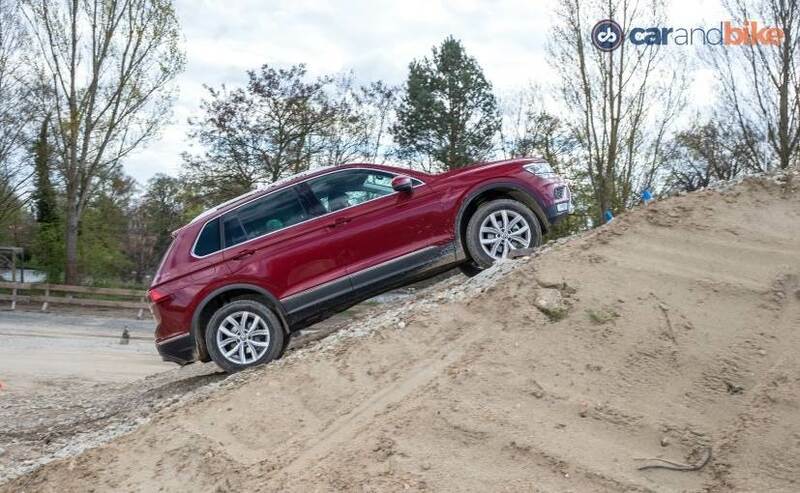 There's a lot more on offer, in the second generation of the Tiguan, and it's not as plain to look at, as its predecessor. The exterior of the car has taken inspiration from both the Golf and the Passat and that's clearly visible. It's not too threatening though, since the idea with this car was to build something that will appeal to the masses. While the character lines on the bonnet create their bit of impact, for us Indians, the 'aggressive' aspect of the car would certainly have made a difference. There are the LED DRLs, which give it a bit of character, but overall it has evolved from its predecessor. In India, however, we haven't seen the previous gen of the car and that's one reason why it should have had a bit more aggression on its face. This is the first SUV to come out of Wolfsburg, on the modular transverse matrix 'MQB' platform; and, there's a lot more space on offer now. 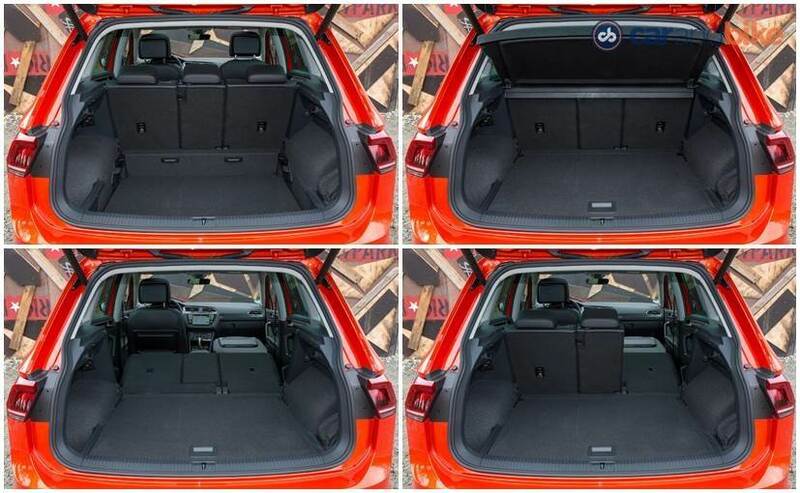 The wheelbase is up by 77mm and this means there's more space, at the rear, without really compromising on the boot space on offer. 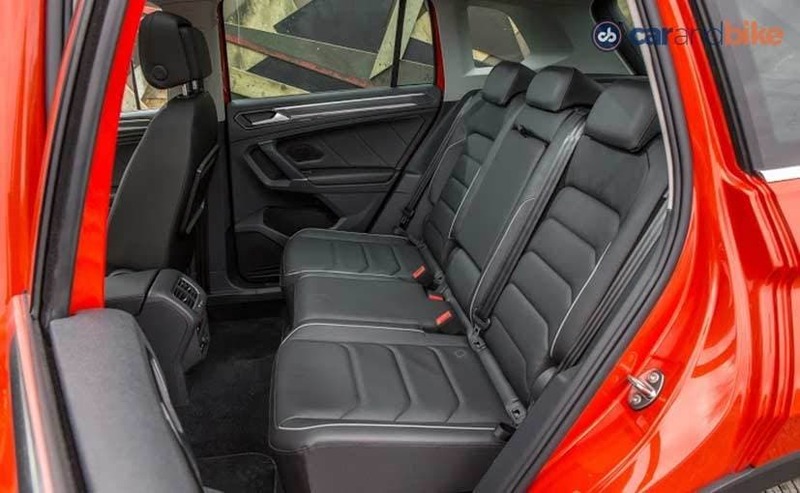 There's a 615 litres on offer and that is closer to what the Skoda Superb has to offer (625 litres), but with the Tiguan, one can fold the two seats, at the rear, to make room for 1655 litres of your luggage and I can say with certainty that a baby elephant might be easily gobbled up by this boot. The engineers at volkswagen have also ensured that the load sill is lower at 722/732 mm; so people would need less effort to put their stuff in. 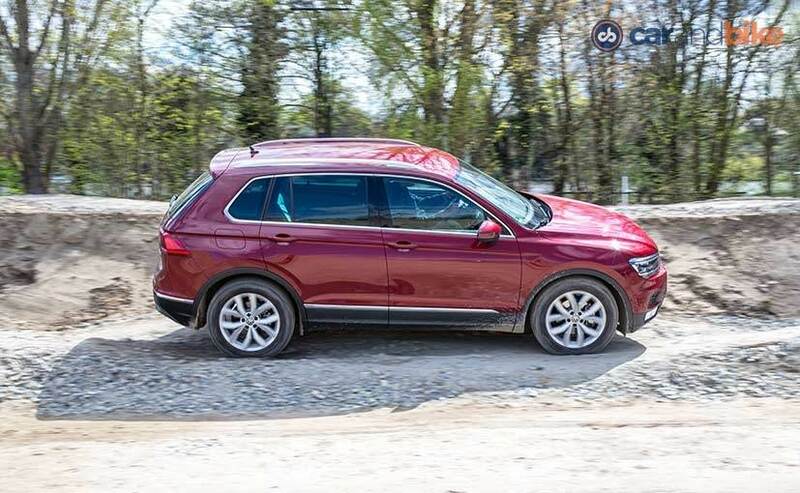 The Tiguan is also 16 kg lighter than its predecessor, but apart from all these numbers, we wanted to check out how capable it was - as Volkswagen shouts out loud that it can 'Access All Areas'. The Tiguan is available, in an array of petrol and diesel engines, but I will stick to the one coming to India. We will get the 2.0-litre TDI diesel engine, which has 147bhp to offer. Now the engine is a peppy one and though available with a 6-speed manual gearbox, India will get the one with the 7-speed DSG. 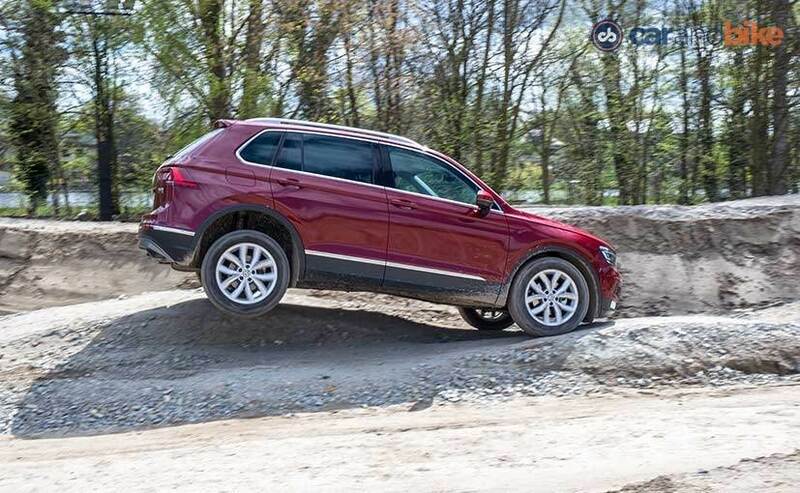 Now, we all know how good DSGs are and the Tiguan feels just as good to drive, from behind the wheel. The gear changes are seamless and even when you push down the throttle, the gearbox reacts to your inputs almost instantly and it doesn't really play catch-up. The flat-bottom steering wheel adds a bit of sportiness to the whole mixture and hence feels quite compact. In fact, there is also a four wheel drive car on offer, but India will not get it, as the guys at Volkswagen said that a two-wheel drive version is enough for India. What we'll miss out on though is the magic of the fifth-generation four-wheel drive 4Motion system. I drove it for a bit, on the road, and even on the off-road track and saw that it provides a faster apportioning of power to all four wheels. This is done through a process that provides pre-activation of the rear clutch and optimisation of the electronic differentials. While there are four variants out of 8 in all (both petrol and diesel) that come equipped with the all-wheel drive system, two get it as part of optional equipment. So, yes, we are getting the front wheel drive variant, which, honestly, is quite nice to drive. It's got a strong midrange and is punchy and refined, but there is a bit of growl from the engine, which might probably be the only sign of aggression it shows. The exterior might lack that special touch, but all is compensated, when you enter the cabin. The quality of the interiors is right up there and is a big improvement. The dashboard gets a unique touch and nowhere does it seem busy or overdone. 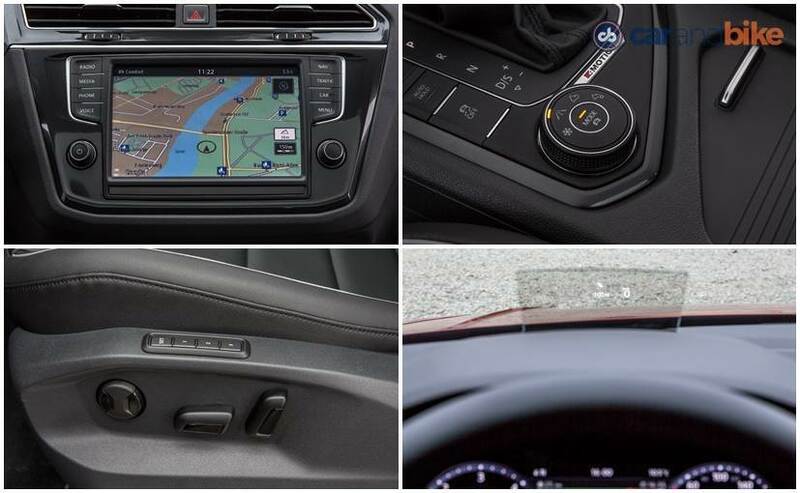 The fit and finish, on the car, is undoubtedly exceptional; but the cabin is a familiar one, for those who might have glanced at the latest generation of the Golf. But it picks up stuff from its other sibling too - the Passat. The Active Info Display high definition instrument panel comes straight out of there and reminds you of the Audi TT as well. There is also a head-up display unit, which uses a small glass panel, behind the instrument binnacle, at the press of a button. There is no projection on the windscreen and while some of us in India might like it, given how the rest of the cabin looks, this addition does stick out like a sore thumb. There are a bunch of gizmos, to keep you occupied too, as the Tiguan comes with MirrorLink, Apple CarPlay as well as Android Auto. There's also the App Connect, which lets you browse, on the go. There is also a Sim card slot in the car, which will help you browse through the burgeoning world of the internet. Additionally, it comes in handy for Navigation and even makes the car a hotspot. So, Volkswagen is making it as alluring as possible for the Indians. But, you might have to wait a while, before you see the car in India, because it'll only come next year and that is a long wait; but, meanwhile, Volkswagen is already preparing itself to see, where it can position it. It is well aware that standing up to premium car makers like BMW, Mercedes-Benz and Audi will not be an option and taking on the likes of SUVs like the Toyota Fortuner or the Ford Endeavour will prove to be a task (considering it's smaller and sans an all-wheel drive), which is why the company is searching for a middle ground. The company will start assembling the car in India, by this year; and while it wants to up the percentage of local content, on the car, the focus would be on the development of the SUV, on the platform. We've already seen the T-Cross and noticed the direction, the German car maker is taking and from what we know now, we just might see a production version coming our way, at the 2018 Delhi Auto Expo. So, as I said earlier, the Tiguan is just the beginning of more to come.